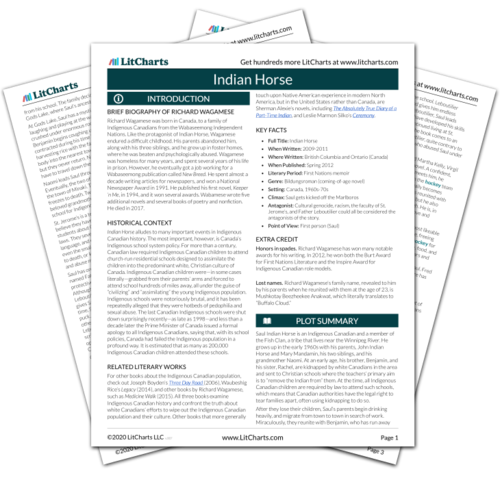 Instant downloads of all 945 LitChart PDFs (including Indian Horse). 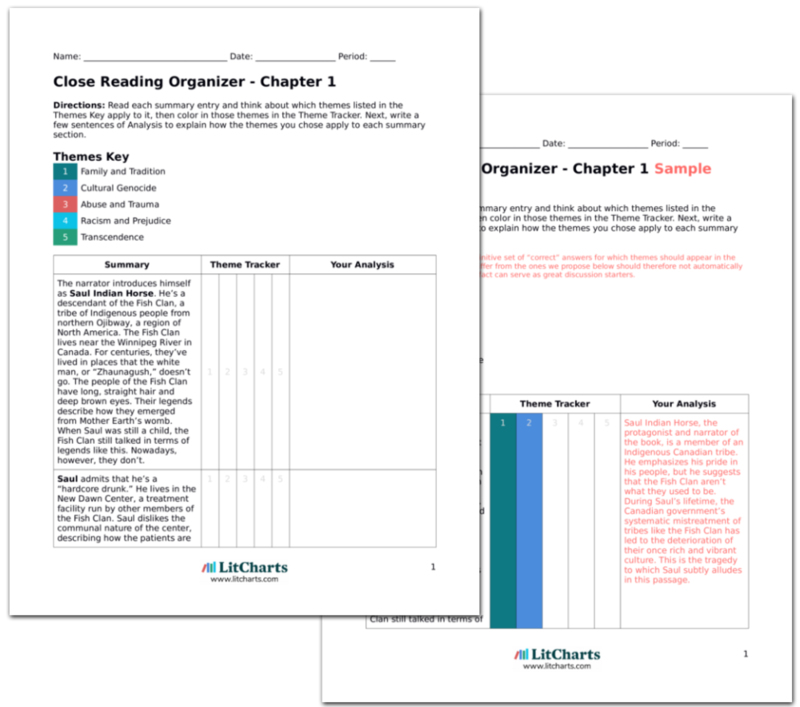 LitCharts assigns a color and icon to each theme in Indian Horse, which you can use to track the themes throughout the work. Saul’s parents never come back from their journey to find a priest. Weeks go by, and Saul and Naomi become worried. Eventually, Naomi tells Saul that they can’t wait any longer: they’ll have to canoe down the river, where it’s warmer, to stay with Naomi’s nephew, Minoose. Saul asks Naomi where his parents have gone, but she says she doesn’t know. It is never explained what happens to Saul’s parents after they leave Saul and Naomi, but Saul and Naomi have no choice but to move on, or risk freezing to death in the cold of winter. Arn, Jackson. "Indian Horse Chapter 9." LitCharts. LitCharts LLC, 6 Sep 2017. Web. 23 Apr 2019. Arn, Jackson. "Indian Horse Chapter 9." LitCharts LLC, September 6, 2017. Retrieved April 23, 2019. https://www.litcharts.com/lit/indian-horse/chapter-9.